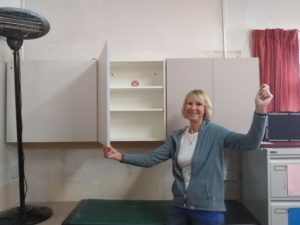 The week rounded off with a delivery of wall cupboards and a worktop. 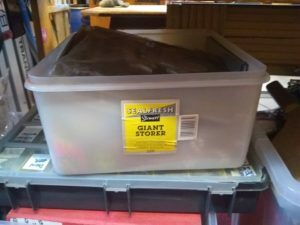 Howden’s have been generous to Littlebeck and Whitby already, but the demand for tidy storage just grows like Topsy (and like several She Shedders). So, on Saturday morning Elaine, husband Steve and Graham descended on Eskmouth Scout Hall and put three of the four units on the wall. We said that Elaine should show it off the the camera, but instead she endeavored to show herself off. But she could not hide the quality of Steve’s workmanship and his expertise with the Birmingham screwdriver. Steve and Graham also refitted a curtain pole and curtains in the main hall. 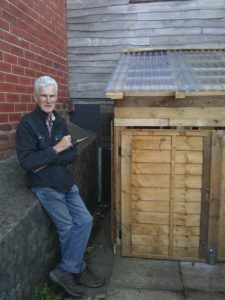 Tony finally finished his beach hut in the garden of Eskmouth Scouts. Just in time for winter. So we decided to use it for a wood store. It was thought that a second home for Graham had been found, but surely he does not fit the description of being a Giant Storer?